Right now there is an estimated 650,000 existing hazardous chemical products, with hundreds of new ones being produced each year. Chemicals are an everyday part of all of our lives. The fact is employees in many different industries work with these types of chemicals in both pure and mixture forms daily. Worldwide at least 400 million tons of chemicals are produced to be used in manufacturing, construction, and agriculture. The frightening reality is for many of these chemicals, little to nothing is known about what kind of immediate or even long-term effects can happen to effect the health of the workers who are producing or using them. OSHA has Permissible Exposure Limits (PELs) for less than 500 of the thousands of chemicals that are used in workplaces. OSHA says each year that illnesses that happen to employees from exposure to chemicals kills nearly 50,000 people. To help protect these workers, OSHA requires employers to establish a comprehensive GHS hazard communications safety manual (HAZCOM) and training policy to address specific workplace chemicals. These OSHA safety policies are proven to help reduce the likelihood of injury and save employers billions. You are probably already aware of the numerous hazards associated working with chemicals, to go with the long list of regulations that your company must follow. Making sure to abide by these regulations can be a long process that requires you to either create a safety training program yourself or to outsource the training to expensive safety consultants. Here at Safety Services Company we have developed a “Do-It-Yourself” HAZCOM safety training kit that is easy to use and fulfills all your OSHA requirements. This certification kit features an Interactive Training Program, Student’s Handbook, Instructor’s Handbook, Student Tests, Training Logs, Certificates, Wallet Cards and More. Our $499.99 kit is a simple three-step solution that can bring all of your employees into full compliance. 1. Classroom/online training: The first step of our program is an electronic training session where employees navigate the training program on a computer at their own pace, and then take an auto graded test. 2. Practical training: The second part of training is at the workplace where your appointed trainer shows the trainee how to apply the HAZCOM materials that they learned in the classroom session. 3. Evaluation: The final step to the Hazard Communication safety training session is an evaluation where the trainer either evaluates the trainee and signs off on their HAZCOM certification, or goes back over topics that may need more work. All certification through the program will meet or exceeds OSHA safety requirements. In addition to meeting OSHA training requirements, the kit also provides you instruction on how to create your own Hazard Communication written policy. If you are not comfortable writing your own safety policy, don’t worry because we can help you write on for a nominal fee. What is OSHA’s Hazard Communication Standard? The OSHA Hazard Communication Standard (HCS) is based around the fact that employees have both a need and a right to know the hazards and/or identities of any and all chemicals they are exposed to in the workplace. OSHA’s standard (Title 29, Code of Federal Regulations, Part 1910.1200, 1915.99, 1917.28, 1918.90, and 1926.59) applies to general industry, shipyard, marine terminals, long-shoring, and construction employment. It also covers chemical manufacturers, importers, employers, and all employees exposed to chemical hazards. The OSHA HCS was changed in 2012 to match the United Nations (U.N.) Globally Harmonized Standard (GHS), which tries to create a standard system worldwide for identifying and labeling hazardous chemicals. This standard relies on three basic concepts. 1. Labels that detail basic information that a person needs to know to handle a particular product/chemical safely. 2. Safety Data Sheets (SDS) that provide technical information about a product’s physical characteristics and its hazardous properties. 3. Worker education to ensure workers have the hazard information and safe‐work procedures they need to do their jobs safely. HCS requires that employers train all their employees on the new label elements and the updated SDS format. 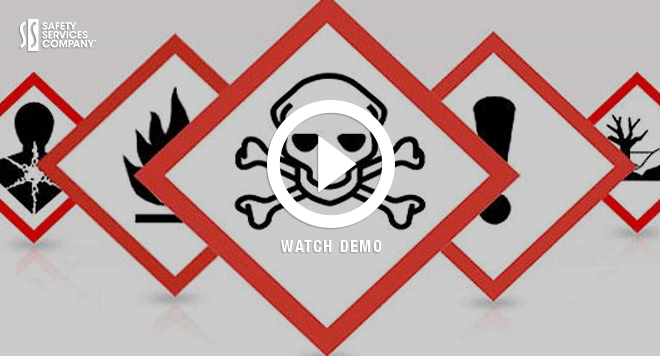 This safety training is needed early in the process since workers have begun to see the new labels and SDSs on the chemicals they are using in the workplace. To make sure employees have all the information that they need to protect themselves from chemical hazards that can occur in the workplace during this period, it is critical that employees fully understand the new label system and SDS formats. The U.N. GHS is designed to be a living document, with scheduled revisions that occur every two years. This schedule will undoubtedly affect the OSHA standards. Our GHS Hazard communication safety training kit allows you to keep your company currently compliant, and will remain that way in the future. Now is the time to make sure your employees, capital assets, and your business are protected. Effective safety manuals will make sure that your employees stay qualified and safe. Contact us today at 888-461-5023 for more information about HAZCOM safety training.